ASUS Ai Charger allows ASUS-powered systems to be used as a fast charger for your iPod, iPhone and new iPad. ASUS Ai Charger turns any PC into a flexible power-up station for popular Apple devices through a simple USB connector, extending their usability and benefit in every lifestyle. 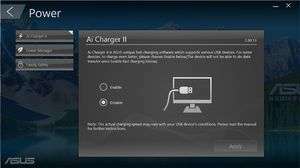 ASUS Ai Charger software is available for a variety of chipsets and motherboards from ASUS as well as all desktops. For security reasons, you should also check out the ASUS Ai Charger download at LO4D.com which includes virus and malware tests. Additional screenshots of this application download may be available, too.